After wonder dog Brandy came the golden retriever Dakota, otherwise known as Ding Dong Dog. Where Brandy had sense and a calm disposition, Dakota had….well I don’t know what she had except that I’m not sure if she could have more than one thought at a time in her head. And preferably it was an EXCITING thought. There wasn’t a mean bone in her body, but at 80 pounds in adulthood, her exuberance made her a bit of a handful. I had rugs with the fringe chewed off and kitchen chairs where the lower rungs were scarred. Just the right height for a resting puppy to occupy herself. Rawhide chew toys that were supposed to last weeks were consumed in 2 days. She definitely did not have the soft bird mouth that Brandy had. I wish Cesar Milan had been around then as some of his advice would have been quite helpful. She finally was able to be calmer when she was about 6 1/2. We had 30-40 teenagers over for a 2000 New Year’s Eve party and all of that activity with so many people finally forced her into brain overload. After that she was able to have a bit more self-control. 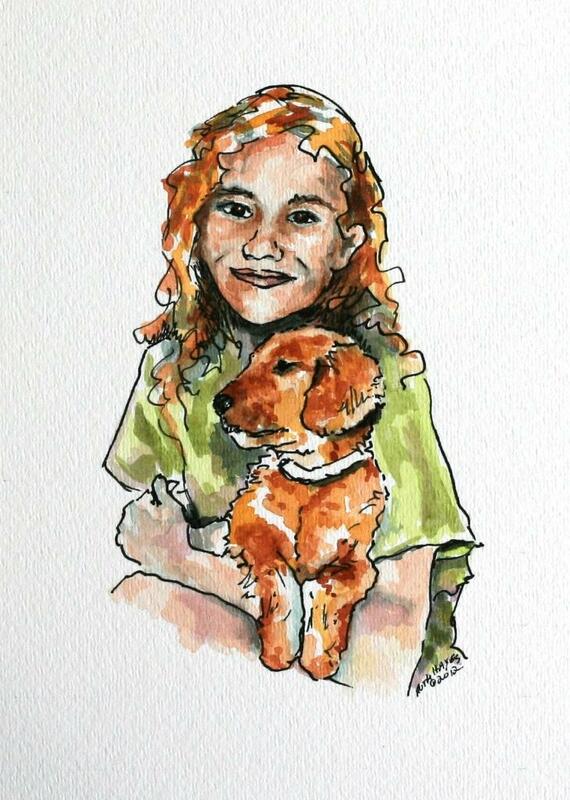 I don’t normally do portraits of people but this photo just seemed so cute. And Dakota looks so innocent. Once again I sketched out the picture in pencil and then inked with the nib pen. The only part I am unhappy with is the lower lip. It should be a little bit rounder. All in all however, since I haven’t done a person portrait in years I am not too displeased. After the inking, I started in on the watercolor layers. I took most of the afternoon alternating with the lower collie picture. Once again I want to not overdo it. In some ways now I may be too far in the other direction and not putting enough color in. It is such a fine line. I will look at these again tomorrow. 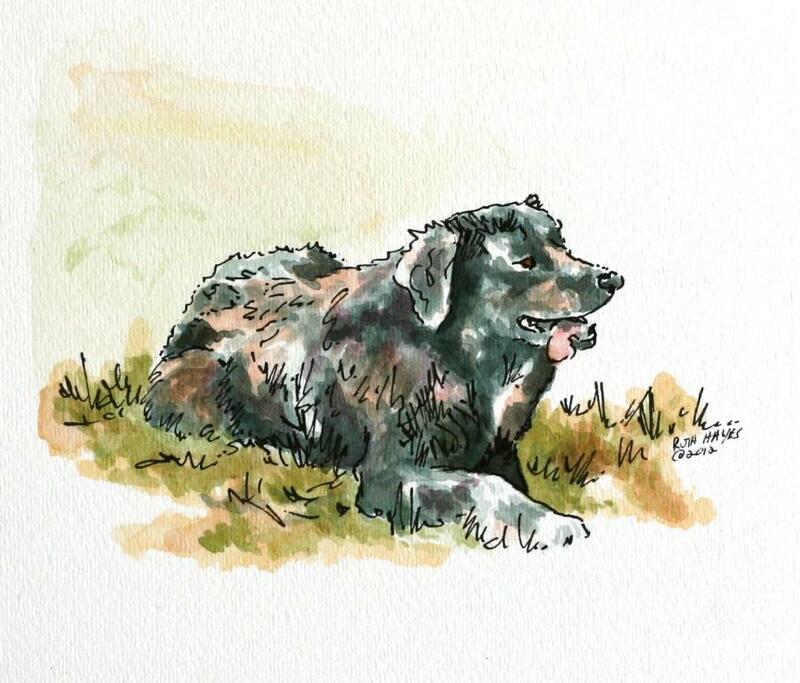 This collie picture is based on a picture of the pet of a relative. 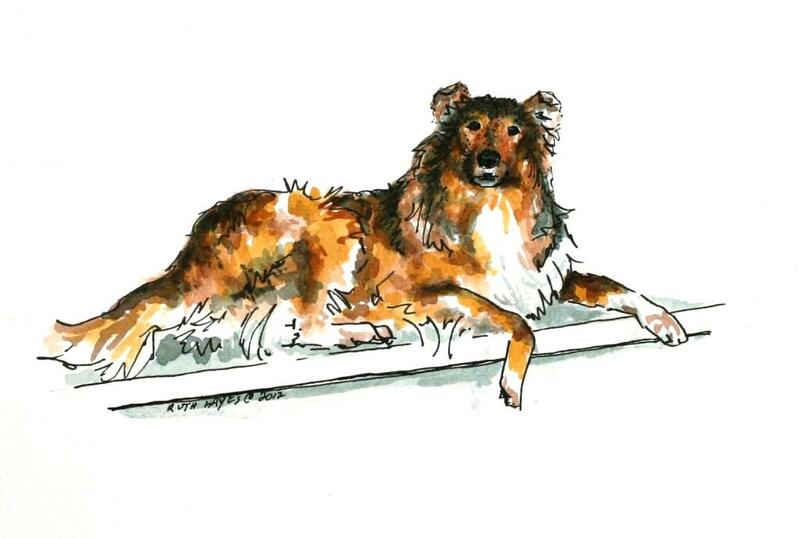 I love sable collies, having grown up reading books by Albert Payson Terhune. I wanted a Lad of my own and did have a wonderful, gentle collie for a few years after college. He, like Brandy, was wonderfully balanced and a joy to be around. Sadly we lost him too soon. I am pleased with the balance of colors on him although I may come back an add a little bit more definition to the head with the pen. I’m not sure where I will go from here. I have a zoo trip in the offing and perhaps another road trip visiting small southern Indiana main streets. I do have a few more pet photos. I haven’t decided whether or not to list these in my Etsy store. Maybe I should set up some listings for breed pictures. Doing portraiture on commission is a lot scarier than the home portraits. Our eyes forgive a lot more in architecture than they do in living portraiture. She was big and black – and the world’s best dog. As I was perusing my photos, I came upon Brandy, the dog we had before the kids were born and the first dog that they remember. Incredibly gentle with our babies and toddlers, she tended to intimidate strangers with her size and deep black color. I have a picture of our 15 month old eye to eye with her and kissing her nose. There is also one of the two of them relaxing on the lawn, our daughter resting between her legs. At close to 80 pounds and sporting double dew claws, we think she was a lab/Great Pyrenees mix. I have been thinking of doing some pet portraits lately, and thought she would make a great subject. I used a nib pen to sketch out her basic form and then layered on the watercolors. She was stone coal black except for one white paw and a white patch on her chest. The sun would bleach her fur out a little, which accounts for the bits of rusty brown. I am not sure I am done with her portrait at this point. I may decide to darken her up a bit but I didn’t want to overdo it just yet. I welcome your opinion. On the flower front, my cone flowers and black eyed Susans have started to be affected by the heat and drought. The petal arrays on both species are smaller than normal and on the cone flowers the purple color has been seriously bleached out. You know it’s bad out there when these start to wilt as they are usually pretty hardy. 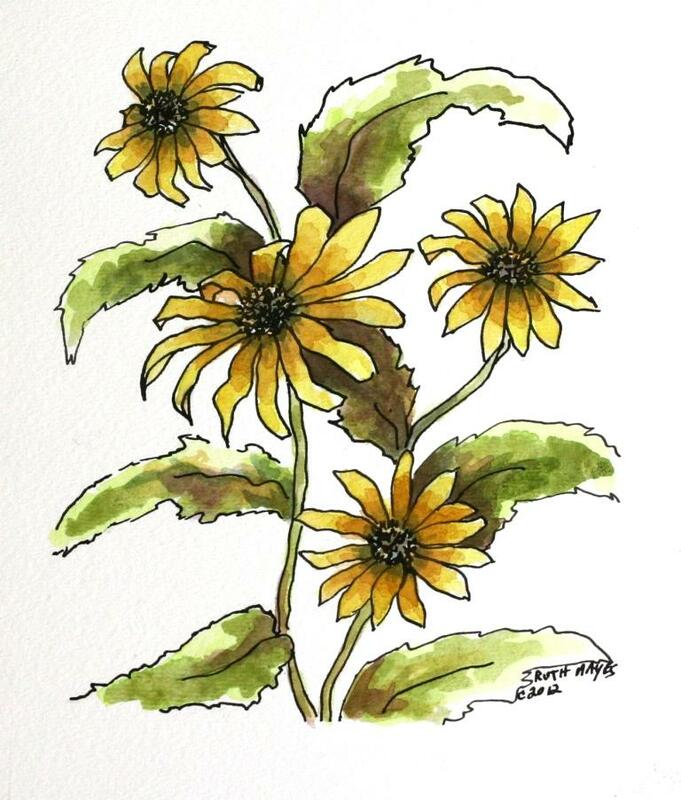 I picked a few Susans from a shaded area that still looked fairly good and brought them in to paint. I kept this one simple too, once again outlining the flowers and leaves with the nib pen. I layered on the yellow for the flowers, following up with yellow ocher, appropriately doctored to a golden orange. I layered the leaves with skip’s green and then with sap green. Then I added a little burnt sienna and my purple. This one seems to have a more illustrative quality to it than most of things I have done but that was intentional for a change. I think I like both of them. 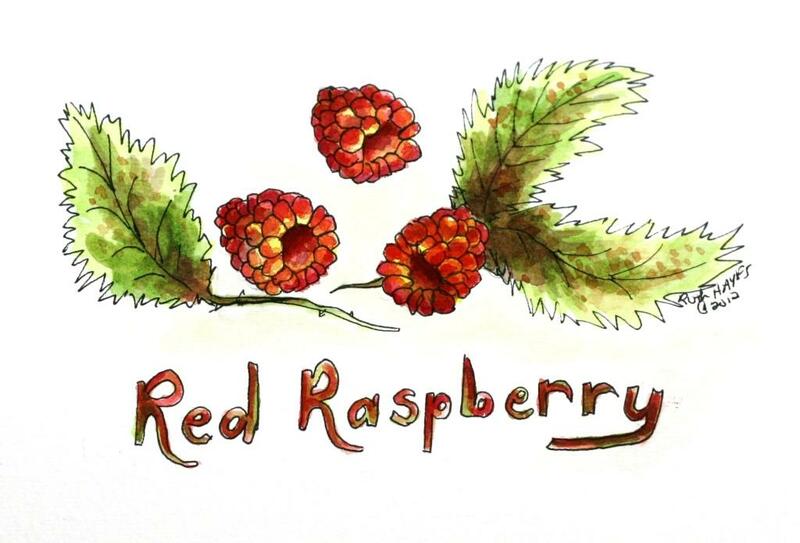 I took a few of my red raspberries from the refrigerator to make a companion piece to the blackberry watercolor. But while the blackberries are home grown, sadly, the red raspberries are not. At one time I had some very prolific thornless bushes but unfortunately I have never been able to replace them. It would seem that they should fall under my live or die rule, but I keep on trying because they are one of my favorites. I cut another piece of board the same size as the last and drew up the berries. Again, I laid on the yellow first and then progressed onto the reds. I used an orangy red called fire engine first and then went to alizarin crimson which appears a bit cooler to me. After several layers of each, making sure that I let the paint completely dry, I put on some purple. I think the raspberries turned out okay, but in putting the pair together, I wish I had put the double leaves on the other side, so that compositionally they were a little different. Oh well, I think the heat and humidity have finally gotten to my brain. When I went outside to take the picture, my camera fogged over and it was only 10 am. Highs close to 100 again. I went out and picked another half gallon of berries today. It may be the last time I go out as it is starting to heat up again and the returns are diminishing. Still, I have picked 2 1/2 gallons in a year of severe drought, so I shouldn’t complain. 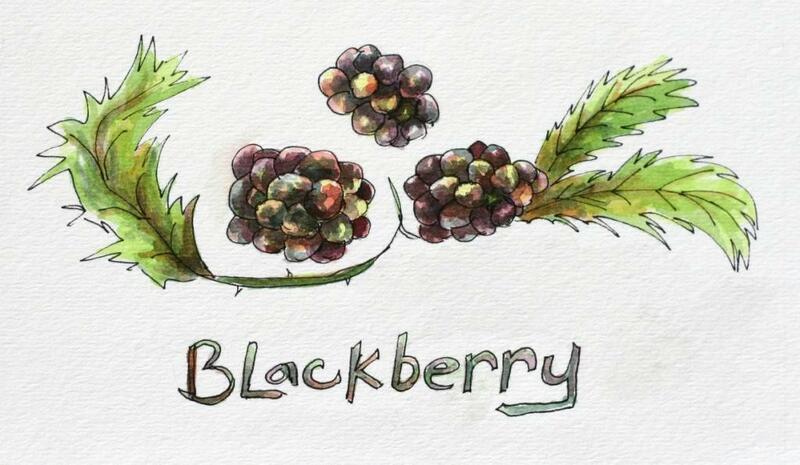 In honor of nature’s bounty in spite of the extremely dry weather, I took a 4.5″ x 7″ piece of leftover board and painted a few of the blackberries I picked earlier today. Once again, I think the leaves aren’t quite right, but I do like the way the berries turned out. I started them out by laying on some bright yellow, then moved onto an orange red. Then came my reddish-purple and lastly my own mix of blue-gray. Even though it is a small painting, I did it over the course of a couple of hours. I felt that not letting the watercolor layers dry completely, even with the use of the hair dryer, would only serve to muddy the berries, especially as I started to darken them. I decided to quit before I got carried away and ended up painting totally over the lighter base colors – an easy thing to have done with the blue gray. Tomorrow’s eyes will tell me if I need to add anything else. I have some red raspberries in the refrigerator and perhaps a companion piece would be fun. Painting Away on a Summer Day. After the latest front went through, the weather has cooled somewhat, but still no rain. I picked another gallon of blackberries yesterday in 70 degree weather so I stayed relatively comfortable in the two hours I was out. I have been keeping a little bit of a wary eye as I have been picking. Our DNR finally admitted a while ago that there were cougars in the central part of the state and my brother-in-law thought he saw one early one morning at the bottom of our joint driveway. I am not particularly worried because I pick in an open area and there are calves in the vicinity which should be more appetizing. And then there are the deer and fawns. As I type this, there is a doe drinking in the shallow end of the pond. 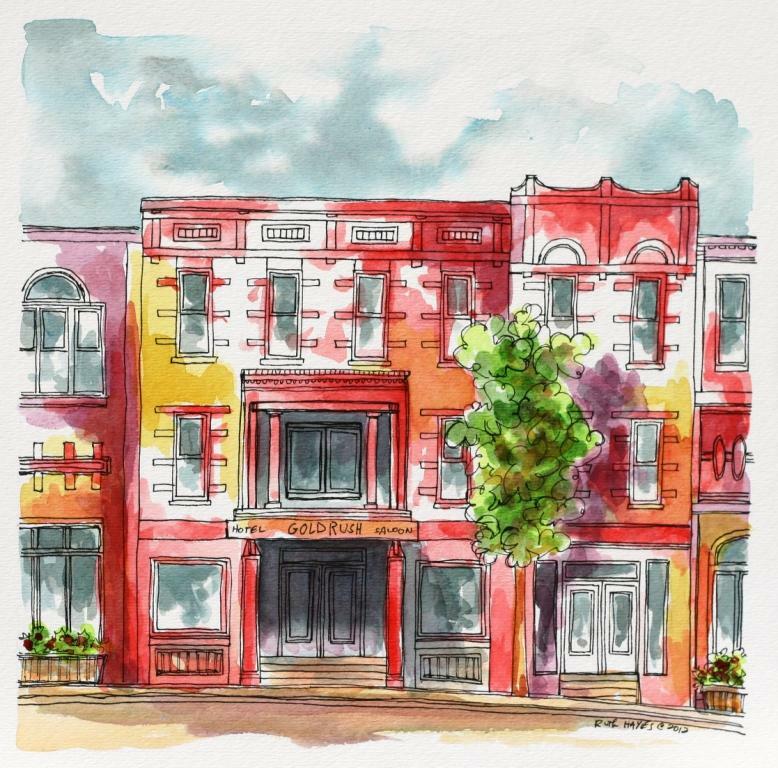 I wanted to do a companion piece to the last architectural as I have been doing these in pairs. This entailed something predominantly red again. I looked through the Utah photos and came up with this one. The central two buildings were basically as presented, but I kind of made up the left and right sides. I did half of the inking one day and then finished the inking and watercolor today. I think it is basically finished at this point. I may change my mind tomorrow but once a gain I don’t want to overdo it. I like the balance of the reds, but I may want to do a little bit more with the purple and the green. I am not sure that the values of the tree are quite where I want them. A little bit of overnight distance will tell. I’ve had it in mind lately to paint a brightly colored bird and I thought I remembered a photo of one amongst the other things when I last was looking through the old box file. Sure enough I found an old picture of a parrot nestled under B for birds. 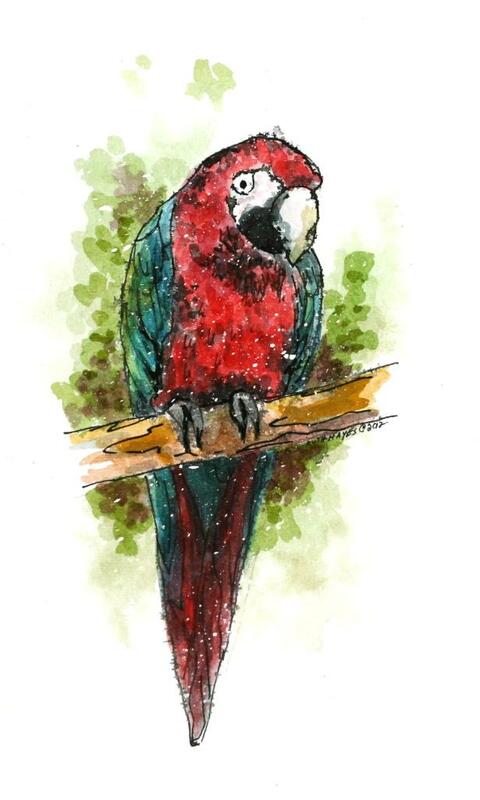 I liked the scarlet reds and the vivid blues of this parrot. It hardly seemed like a possible combination for a real bird, but there it is. I went the route of the frisket/spritzed ink, but this time I held a little back on the water in order not to muddy the overlayed colors too much. I played with the watercolor over two days and am fairly satisfied with it. I am less satisfied with the inking. There seems to be a very fine line between too much spritzing and a muddy, gray result and too little spritzing and too sharp of lines. In this case, I think I erred in the direction of too little spritzing. The feather lines seem to be too delineated. I wanted to show more the suggestion of feathers rather than the actual feathers themselves, but that is not quite what has happened. I am not totally dissatisfied with the outcome, because I do like the colors but, like the blue abstract floral, it’s not quite what I wanted. After letting the last watercolor sit for a few days, I decided to just go ahead and put on the ink. I felt that laying on more watercolor would only end up muddying the situation, so I pulled out the nib pen and started laying on the india ink. It actually took quite a while to work through the inking even though it is only a 3×9 drawing. I didn’t want to overdo it and end up with a blacker mess. I like it marginally better at this stage and will probably let it sit a while. Maybe time will give me a better idea about what to do with it. I had one more 4×10 piece so I decided to try a modified high-rise cityscape. I quickly laid out a dozen tallish buildings and then put in rows of windows and a couple of trees. I left a little open space between some to suggest streets. I first added the reds, purples and ochers, and then washed in the sky. I slowly built up the colors of the sky and the buildings, layering on mostly the same colors, but at one point I threw on some of the sky color to tone down the buildings. They ended up a little too vibrant to me so I muted the hues somewhat and that also helped to unify the painting. And lastly, this morning I spent 2 hours picking blackberries. The 1.25″ of rain we received over the weekend served to not only save but also plump up the berries quite nicely and I was able to get a gallon. In fact there were so many nice ones that I could ignore the smaller ones. The bowls fill up faster when the berries are large and the bigger ones tend to be sweeter than the smaller ones as well. 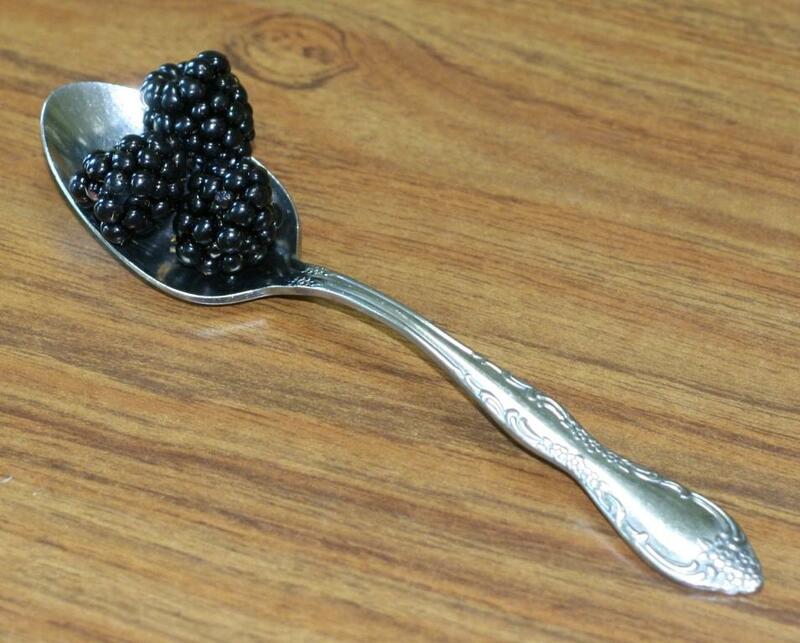 As you can see from the photo, it didn’t take many to make a spoonful. These measured almost 3/4″ long – almost as big as the commercial berries.